Algae is widely considered to be the perfect source for biofuels: it grows so fast it can double its biomass in a day, and it can be farmed cheaply at large scales. At Manta Biofuel, our mission is to commercialize the production of biofuel made from algae, by making it cost-competitive for the first time. In 2014, Dr. Ryan Powell and Onur Unal founded Manta Biofuel, with the goal of commercializing a process to produce renewable crude oil from algae. Their motivation was simple: we have a global infrastructure that is dependent on crude oil, and there is no technology that exists to make this infrastructure renewable. Plenty of companies are successfully making renewable fuels, but we are still dependent on fossil fuels because there is no cost-effective, renewable replacement for crude oil. 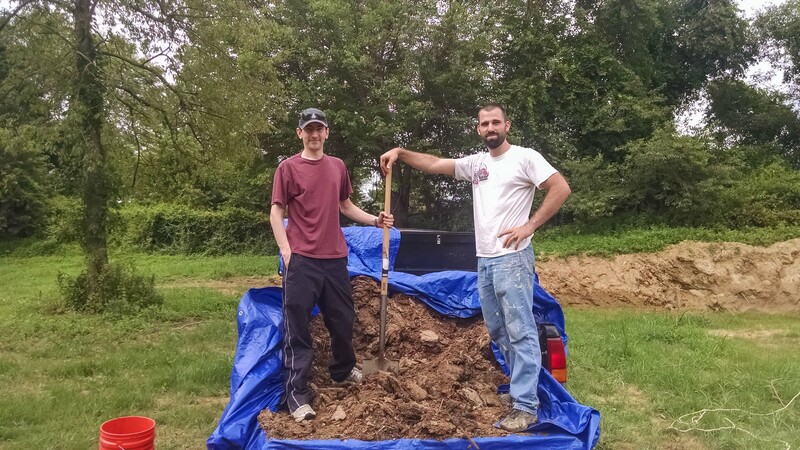 Onur and Ryan, initiating the company's first algal bloom in 2014. Why can’t wind and solar energy eliminate our dependence on oil? Renewable energy such as wind and solar is successfully making our electricity grid more and more renewable. However, the marine shipping, automotive, trucking, aviation, and manufacturing industries are heavily dependent on oil, and this infrastructure is difficult to change. Only 0.1% of transportation is powered by electricity; the rest is through liquid fuels. A renewable replacement for crude oil has the potential to make these and other industries renewable by working with the existing infrastructure. metric tons of CO2 emissions could be avoided every year in the United States by using crude oil made from algae. The main focus in developing renewable fuels is cost. Many companies and research institutions have successfully produced renewable crude oil from algae, but no one has been able to produce it cost-competitively with fossil crude oil. Most attempts to produce fuel from algae have used highly engineered and expensive growth and harvesting systems. These expensive systems result in fuels with high production costs which cannot be sold cost competitively with fossil fuels. Algae is a type of microscopic plant that grows incredibly fast. It can double or even triple its biomass in a single day- equivalent to a tree growing from 8 feet to 16 feet tall in a day. Because of algae’s rapid growth rate, less land is required to grow it compared to other biofuel feedstocks. "Electric cars hold great promise, but the challenges of deployment at scale mean that internal combustion vehicles will be with us for decades. It is incredibly difficult to electrify air travel and long-haul shipping across oceans... While the United States is capable of producing sufficient biomass to displace all liquid fuels, we don’t yet have cost-effective ways to convert it." At Manta Biofuel, we’ve developed a suite of technologies that enable us to produce renewable crude oil that is cost competitive with fossil crude oil. Our proprietary technology allows us to harvest algae grown naturally in open ponds. We farm algae instead of manufacturing it. This allows us to keep production costs lower than previous algal growth systems. We’ve also developed innovations that allow us to convert algae to crude oil much more cost effectively than has been done by other companies. Can the growth system actually be scaled? Our growth system is similar to a rice paddy (pictured here). It is a simple, shallow pond where we farm algae. This type of system has been proven to be sufficiently low cost and scalable for production of commodity rice, which produces less value per acre than algal biofuel. Our system can use types of land that cannot be used for traditional agriculture, alleviating the food vs fuel concern present in discussions of other biofuels. The Department of Energy determined that 106 million acres of non-arable land in the United States are available for production of algae. Our algae growth system can also use salt water and brackish water in addition to fresh water, mitigating concerns about competition for water resources. Currently, we have solidified our core technology, and are working on demonstrating our process at scale. We have field-validated the individual components, or “unit operations,” of our system. Our current task is integrating these components into an automated production pipeline and scaling up production at our 15-acre pilot facility. We plan to sell the renewable fuel oil produced from our pilot scale facility to local residential and commercial markets. After validating reliable operation of our pilot facility, we will develop a demonstration facility. This facility will utilize larger production ponds that are our final target size. The goal of the demonstration site is to demonstrate reliable production at scales that are economically viable. 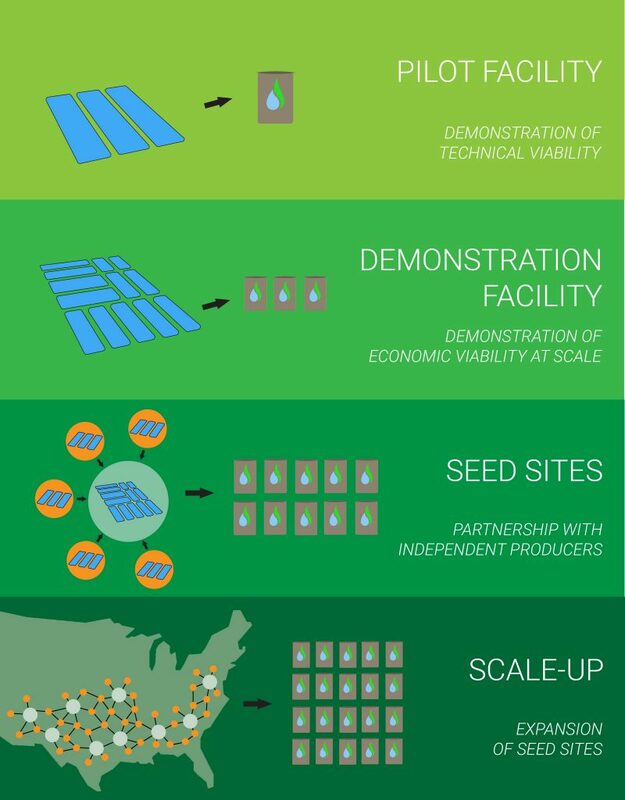 Once we fully validate reliable operations and economies-at-scale we will develop company-run “seed sites”. These sites serve as show places to recruit independent production partners. These partners, who will be local farmers and land owners, will be able to produce oil independently, similar to a franchising model. This model has been used successfully to rapidly scale production of other agricultural products. We will continue to scale by building more seed sites in suitable areas across the country. Manta will sell algal biofuel production equipment to these independent producers and offer equipment maintenance/repair services. Partnering with independent land owners will facilitate rapid expansion and rural economic growth. Our vision is a world powered by algae. A world where our energy sources are sustainable, and our planet is preserved for future generations.